So Zuluwannsago made it back from Morocco. All in all, it was an absolutely un-believable/life changing experience. At this ‘universe moment’ I was filming AND playing trumpet — as you can see/hear! Only after the camera goes down (on my trumpet case) can you hear me playing. ANYWAY, this clip is very near and dear to my heart; it really documents a place and time. The sub plot of the Tanjazz experience was that I met this fashion designer from Philly named Taji Naal. We met, We talked, We did a session, I did the music for his fashion show. Now it’s being turned into a documentary. More on that later. I came back to Slamsterdam and jumped right into the second segment of the Live Cinema residency at STEIM studio. 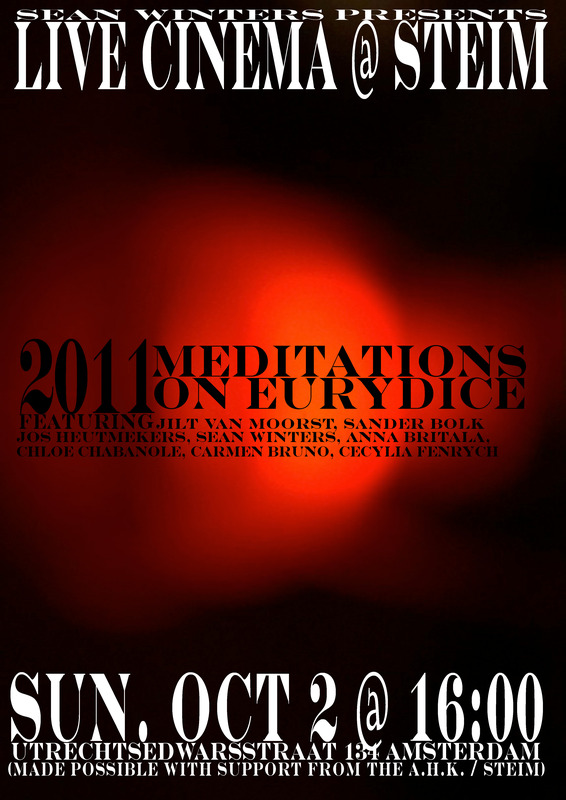 I worked (a little too) hard to present 2011 Meditations on Eurydice (October 2nd, 2011 ). So so so so much can be said about this performance. I will have to go further in depth at a later date. Highlights included; the string 4tet sounding amazing, late night conversations with jos about trusting artistic decisions, refining/smoothing the live cinema process into a science, the toe, the rug, the beverage being involved, and the toe. Now I have officially transistioned into what I have come to term Fokker5000. I’m back in Studio1, finishing the microtonal piece composed for the Fokker Orgel entitled “Ode Aan Het Ij” (premiered at the Gaudeamus Muziek Week in 2010. I’m working on a stereo piece (1 for speakers, 1 for headphones), and a full on electro-acoustic 8 channel version. Just writing all of this down has fried my egg. Tomorrow is another big day. That to me is proof that G-d exists! Traveling with this band is really like being part of a circus. Only one bag, and allllllllllmost one passport were lost on the way here. Thank the lord for that beautiful Spanish flight attendant. Because of her one musician avoided being introduced to Africa by the police! Oh yeah; how could I forget? We almost missed the first flight that left from Amsterdam. I have no idea how road-managers do their job!? Me, my trumpet, my crucials, and my luggage all made it here safe and sound. Maintenant, je vais parle francaise parce que je suis dans le morroc. No no no no no, not enough energy for that right now. Tomorrow night we play at the Tangier palace at 1am. I really think it’s going to be one of the best shows we’ve ever played. I’ve decided to make it my new mission to bring as much positivity to this group as I can. It’s just sooo difficult being surrounded by sooo much negativity sometimes. A few of the guys in the group are really religious, and I think it’s starting to rub off on me! It’s another thing to actually live your life like that. Being kind, compassionate, trusting, and optimistic can actually be quite difficult! There’s just so much stress/drama in this world sometimes! It’s hard to know when to speak up, and when to just keep my mouth shut. Yusufu is the fire; raw/un-tamable. his energy is so intense that usually it just causes confusion. but that is not HIS fault. being a good listener can be invaluable when someone is trying to explain their ideas. especially when they’re from a creative space. again, it’s easier to say than to do. Anyway, www.zuluwannsago.com is officially online! I put it up the day before we left. It’s very far from perfect, but it’s up and running. I hope it makes Yusuf’s life easier. That guy works so hard; it’s about time he starts getting some back. Went to Zaandam yesterday to work with Yusuf… spent all night filming him and working on the website. I’m realizing more and more how crucial it is for ALL artists to be able to wear ALL hats these days. Web development has become an almost everyday affair. SHED the modes, SHED the scores, and SHED html/css::: I really can’t stress this enough to any “artists in training” out there in the universe who might be reading this. I’m working on www.zuluwannsago.nl for Yusuf so that the world can really see what a bada*s he is. Once the site is online the first thing you’ll see is the fruits of our labor last night in Zaandam in Yusuf’s basement. This guy has so many instruments in his arsenal. Would’ve taken two days to document him playing them all. I really learned a lot about Yus’s background in the process of making this video; turns out that he’s descended from a royal family of healers in Ghana. People would come from all over Ghana to be healed by his family. The best part was definitely learning that they actually use drums/rhythms (or “languages” as he calls them) to heal people who are in need. we don’t know nothing about it. that’s how it works spiritually. spiritual fighters, spiritual killers won’t shoot you. they’ll find you when you’re sleeping. the skin is slipping, it’s week. that will fight your body back. no monsters in my house. sometimes people play the music with me. but they don’t know who I am. I teach them how to live live. how to love one another. don’t ever think bad about nobody. if you see someone whose 95 years old. it’s just the free mind, and the free heart. no disease will come near the tent ever. the free mind is powerful. the free heart is powerful. slowly the heart is getting weaker. the mind is getting weaker. not developing to be stronger. be free in the heart and mind. Well, here we go; the first official post on my brand spankin’ new blog — mixed feelings. A sentiment that is shared by countless cats in my generation. I’m back in the slamster-dam, gearing up for Morocco with Zuluwannsago. Yusuf Nuweku (the composer/bandleader) is one of the best musicians I’ve ever worked with. He’s the fire. raw, un-rated. Unfortunately, a lot of this world works off of more than universe juice. 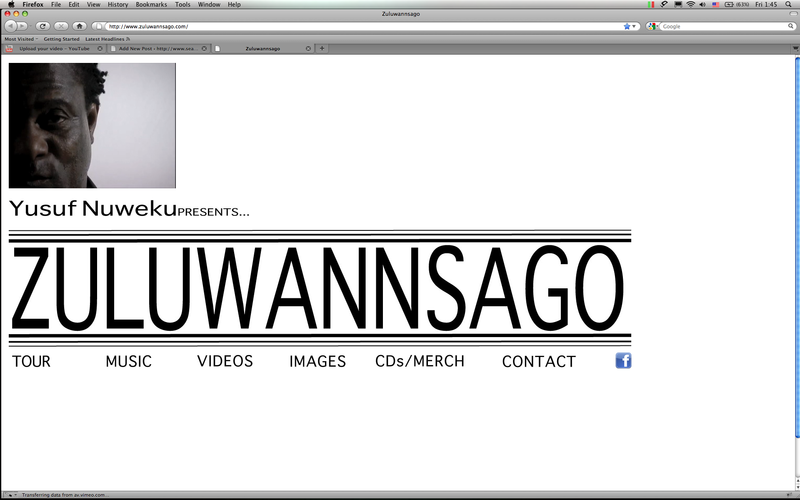 I’m in the process of building www.zuluwannsago.nl with Yus so that he can start REALLY hustling the band. feelings of entitlement lead to anger and frustration. be thankful for what you have; not angry about what you don’t. I just hope that we can all put aside our egos and play yusuf’s music how it’s supposed to be played. I really have nothing but respect and love for that man. I once saw him eat an entire RAW ginger root (the size of a big hand) in the course of one rehearsal. I’m definitely excited to go to Morocco with these cats. vibrations to whoever might be reading this blog in whatever dimension they might be in.